A tachometer is an instrument for measuring the angular velocity of a rotating shaft. The simplest is a timed revolution counter. Other mechanical tachometers included the centrifugal tachometer, similar to the flyball governor; the vibrating-reed tachometer, a group of reeds of different lengths which is held against the shaft housing so that the reed whose natural vibration frequency equals the rotation frequency of the shaft vibrates by resonance; and the velocity-head tachometer, in which a pump or fan on the shaft produces a measured air pressure. Electrical tachometers are usually electric generators or electric impulse counters. The eddy-current tachometer is used as a speedometer. The centrifugal tachometer (see illustration) measures the instantaneous rate of rotation of haft. It is capable of accuracy to ±%1 of full scale value. Weights held in central position by bushes. 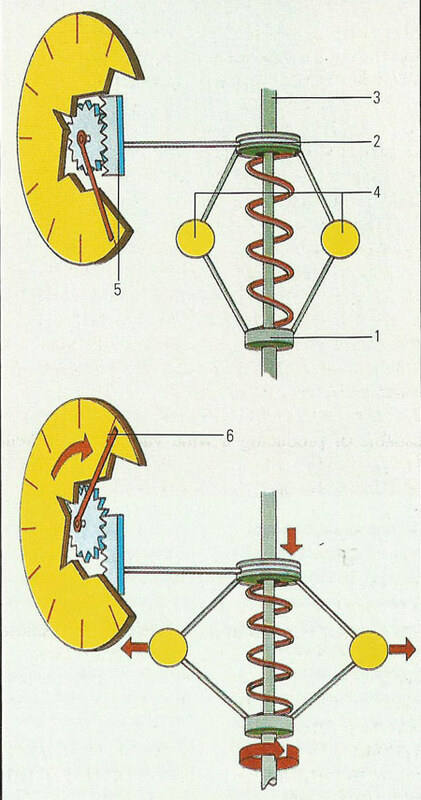 As the shaft rotates, the weights move outward due to centrifugal force. The pointer then moves, indicating speed. Rack and pinion. When the moveable bush slides up the shaft, as the weights move outward, the rack and pinion mechanism operates and the pointer moves.